Who says you can't have the best bits of a Tele, an ES335 and a Les Paul Special in one affordable guitar? A lovely neck and a wide breadth of very different tones makes the guitar a viable proposition for just about any style short of metal. There are a number of excellent tones here, and the look has really grown on us too. A slightly hotter bridge pickup would improve the tonal options. The switch arguably needs moving a couple of mm to the left. The St Blues name has a rich heritage indeed: not many companies can boast associations with the likes of Eric Clapton, Jimmy Page and a certain Elvis Aaron Presley in the same breath. This new 61 South electric is a member of the Korean-made yet US-designed and tweaked series. Tonal versatility is the goal here as this particular example offers a tapped Tele-style bridge single-coil and a P-90-style pickup at the neck, but you can also opt for a configuration that includes a pair of custom-wound T-type single-coils that are both tapped. 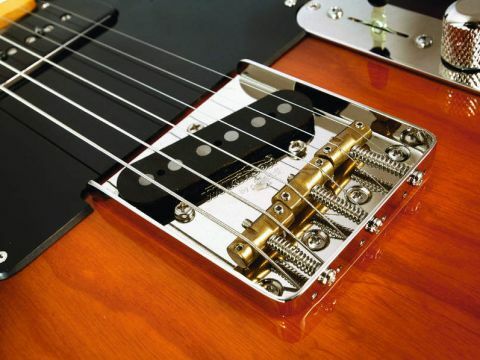 St Blues estimates that the tap on the bridge single-coil cuts out 25 per cent of the pickup's output and it's activated by the pull/push switch on the tone pot. The remainder of the controls comprise a volume and three-way lever pickup selector that, as you'd expect, allows you to combine the bridge single-coil (full or tapped) with the throaty P-90 as desired. Although the ash body possesses a modest f-hole, the body is best described as chambered rather than semi-acoustic, and although we were at first less than enamoured with the rather squat body design, it does lend itself to a very intimate playing experience as you can really envelop yourself around the guitar. It's very close in vibe and feel to the Gibson Blues Hawk, a small and similarly designed guitar that Gibson discontinued from its range in 2006. Where the body leans towards Kalamazoo, the one-piece hard rock maple neck is pure Fullerton, boasting 21 excellently finished frets, that feel a tad fuller than those vintage-style thin Fender wires, and a cool headstock that sits somewhere between a classic Tele and old-style ESP designs. The neck's feel is of a more modern 'C'-shape and, with a standard 43mm wide bone nut, is a familiar experience to get to grips with. Tuners comprise a set of Kluson-a-likes, which accedes to the vintage vibe nicely, and the whole neck and 'board is thinly coated with a gloss finish. We find the mix of the Fender-style bridge pickup and, in effect, Gibson-style neck single-coil most agreeable. There's plenty of clean twang available from the bridge pickup, which cuts and thrusts with the best of them. Activating the tap reduces most aspects of the tone, not just the output, and the ability to reduce the brash treble on demand proves useful. However, with a subtle clean tone, the output proves almost too quiet and polite at times; maybe St Blues should consider fitting a hotter, but still tap-able, pickup to compensate? The P-90 in contrast is smooth and articulate, and reasserts the guitar's impressive versatility. With a standard rock or blues tone the middle position is difficult to beat, offering equal amounts of tonal girth and cut that are perfect for many rhythm sounds. Of course, tapping the bridge pickup rounds the tone off even further, which produces a mellow tone that also works well with higher gain settings that overcome the drop in output. The only slight moan we have is that, with the pickup selector switch in the bridge position, the cap itself is a little fiddly to grip for quick changes. You have to manipulate the tip of the black plastic itself because there's not enough room to fit your finger between the switch and volume pot. That said, It's hardly the end of the world. All things considered, the 61 South is a well-made and eminently playable instrument. At a hair under £580 it's around £81 more expensive than a '50s Tele from Fender's Classic Series, but the 61 South offers more tonal options thanks to the tapped bridge pickup, P-90-style neck single-coil and some extra resonance from the chambered body. It plays very well and sounds impressive, and if you can dispel any doubts you may have regarding the quite squat design before you pick one up, you may find it difficult to put down.